Tag is a film that believe it or not is based on the true story of a group of friends who continued their game of tag well into their adult life and would continuously go to all new extremes to ensure they didn’t get tagged. Directed by Jeff Tomsic the story focuses on four friends who band together to finally tag their mate who has never been tagged in the entire 30-year run of their game. It makes total sense that this movie got off the ground as the premise alone is enough to sell someone on buying a ticket. But where the premise is great and most certainly unique, much like the titular game itself this movie does get really old really quick. It’s not at the fault of its stars or even the story as all of that is fine, it’s just that the core concept isn’t substantial enough to remain engaging for a full hour and 40 minute feature. 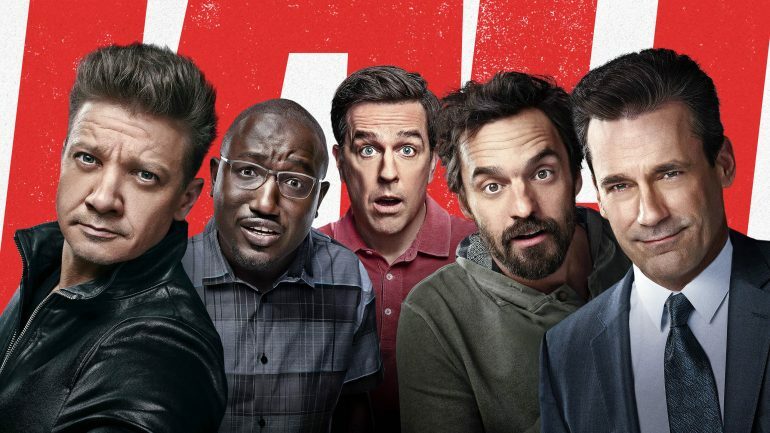 Other than the premise itself the big draw here is the cast which includes charismatic entertainers such as Ed Helms, Jeremy Renner, John Hamm, Jake Johnson, Hannibal Buress and Isla Fisher. Everyone plays their part and they’re great as an ensemble piece. I really bought into the fact that I was watching a group of friends who had known each other for 30 years and it works. The chemistry is there, the banter is present and I feel anyone who watches this movie can draw some connections to there own group of friends to some extent. I’d say each member of the cast does elevate the other but if I was to pick out a standout it would have to be Renner who plays Jerry the master-evader who has never been tagged. He just has a certain charm to the way he plays the role which makes you hate the guy but also love him at the same time. Isla Fisher I will say does have some quite funny moments sprinkled in here and there so she isn’t wasted. Annabelle Wallis on the other hand sort of floats her way through the story with barely anything to do. She plays the reporter writing a story about this crazy situation and she’s along for the ride but doesn’t really impact the story all that much. As I mentioned earlier this movie doesn’t hold up for its entire runtime, in fact after the first act the schtick started to run dry and I began to lose interest. The plot doesn’t go in a bad or downhill direction or anything, it actually remains steady in pace and goes down the logical path you’d expect it to. It brings a good amount of action in the slow-motion filled ‘tag’ sequences but the humour does start to wear out over time. There are a couple of laughable moments here and there but nothing big and memorably funny which is a shame. I think it’s just one of those things that was cool and interesting for the first 30 minutes, you get an action sequence or two and then it just feels like you’re waiting for it to end as it cycles through a very basic formula. Within the action scenes I will say I don’t mind the use of slow motion but I think it is very overdone and does mess up the excitement of a number of those sequences. The constant slowing and speeding does become jarring a little but not a total deal-breaker. Other than that there really isn’t a whole lot else to say about Tag. It’s a slightly sub-par action-comedy that takes a really interesting premise and gets everything it can out of it which unfortunately isn’t that much. The cast is good, the performances are more or less pretty strong, there is the occasional mild laugh and clever action sequence but it’s all not enough to hold my engagement for the full runtime. For anyone looking for an easy action-comedy to watch at home this’ll do but don’t expect a whole lot beyond the fantastic premise. Fantastic review, but this doesn’t really sound like my kind of movie. Renner is pretty good though and he’s hard not to love, as you say!